Since Central Bottle opened last year, it has become my favorite place in Cambridge – and I like a lot of places in Cambridge. Owners Dave and Maureen Rubino (who I met last night), Liz Vilardi, and Nick Zappia have been players in the Boston food scene for years already. 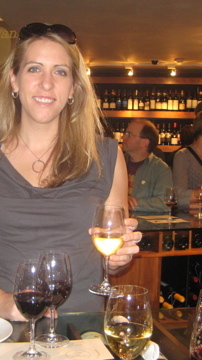 Vilardi and Zappia are co-owners of The Blue Room, and Maureen was previously the long-time GM of East Coast Grill and is married to Dave, an architect who designed Central Bottle. Each time I go in I’m greeted by an enthusiastic member of the staff, and it’s clear that this place is run by people who are truly excited to be doing something they are passionate about. 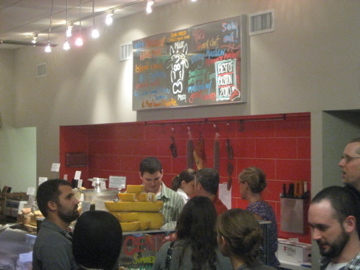 Along with wine, Central Bottle sells beer, cicchetti, cheese, bread, olive oil, various sauces and jams, and charcuterie. On Thursday nights they become a wine bar (you can order a tasting flight), and they frequently put on cheese classes or tastings. And, once a month, they have a Guest Chef Tasting. Last night I attended the sold out event featuring Barry Maiden from Hungry Mother (my other favorite place in Cambridge), and neither myself nor my enthusiastic partner were disappointed. One of my favorite parts about events at Central Bottle is that you eat and drink over their wine racks. The racks appear to be wooden (SB doesn’t know anything about those kinds of things) but are topped with glass, and the act of standing over them instead of sitting down at a table makes me feel like I’m right back in Florence, standing at the bar and relaxing. 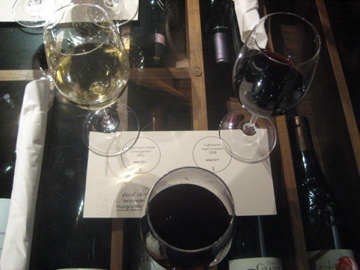 Last night’s event featured three wines paired with three small tastes. 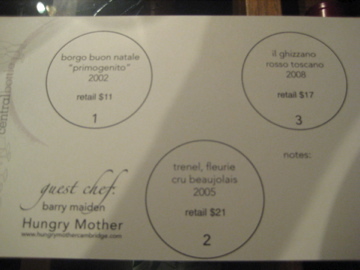 First, a white- Borgo Buon Natale Primogenito (2002, $11/bottle). 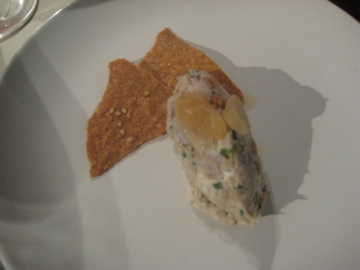 Light, clean, and mineral forward, it was an excellent compliment to the Smoked Bluefish Pate over Iggy’s Sourdough Sesame Crisps*, topped with what I believe was shaved garlic. Though I don’t normally reach for fish spreads, this was excellent and my favorite cicchetti of the evening. 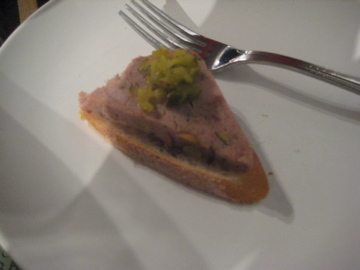 The second course was a Trenel Fleurie Cru Beaujolais (2005, $21), paired with a Country Style Pate- smoked pork loin on a baguette with whole grain mustard and house made bread and butter pickles. The pairing brought out the smokiness of the pork but didn’t turn bitter when the pickles hit your tongue. The last course was an Il Ghizzano Rosso Toscano (2008, $17), the heaviest (but I thought the smoothest) of the wines, served with a Mushroom Duxelle in Puff Pastry with Gruyere. This was my favorite complete pairing of the night, I could have eaten ten of the pastries and had far more than the tasting glass of wine. There was a silky bon bon type of treat at the end of the event, but I don’t recall exactly what it was- suffice it to say, it was a perfect end. I will say that my date was still starving after the event (remember, it is a tasting, not a meal). If your date gets cranky at the end of a Central Bottle Chef Event, promise them dinner at Central Kitchen or The Blue Room. If you go when the event starts at 6, you will be done in plenty of time for a 7:30 reservation, and already loosened up for the rest of your evening. 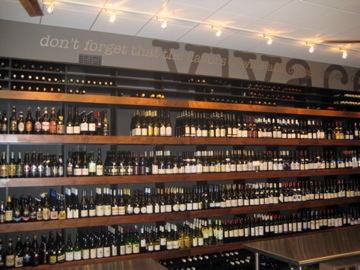 Come back the next day to buy your favorite wine, say hi to Maureen, and spend a few minutes wandering around the racks. *The reason I have all of the information about the cicchetti is because a lovely woman, whose name I did not get/can not remember (Rachel? ), was nice enough to write it down for me. Thank you!